In our previous study with athletes, we found that taking Chlorella from 4 weeks before the start of a camp training suppressed decrease in saliva production induced by physical fatigue during the camp (Nutr J, 2012). There are many factors increasing risk of decrease in saliva production (dry mouth) other than fatigue. Therefore, we studied influences which taking Chlorella had on the secretion rate of saliva in those with reduced secretion volume. We had 45 subjects of male and female between 19 and 76 year-old with no smoking habit take Chlorella for 4 weeks (twice a day, 15 tablets/time). We harvested saliva from each subject before and at the 4th week after initiation of taking Chlorella by chewing sterile cotton at the rate of once per second. After harvesting, we measured each weight of saliva, and calculated the secretion rate assuming that the density of saliva was 1 g/mL. As the result of dividing those subjects into the secretion rate Low and High groups using the median of the rate before taking Chlorella, we found that age (44.6 vs 30.8 year-old，P = 0.03) and body fat percentage (27.0 vs 19.3 %, P = 0.0003；age correction implemented) were higher in Low group than in High group. 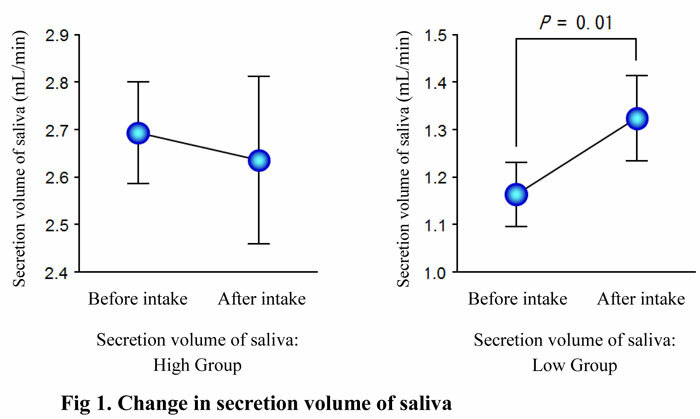 While significant difference in secretion rate of saliva was not recognized between before and after intake in High group, secretion volume of saliva increased after intake compared to before intake in Low group (1.16 vs 1.32 mL/min [+ 13.8 %], P = 0.01) (Fig. 1). The secretion rate and volume of saliva was lower in elder persons as well as in those with obesity trend compared to younger persons and those without obesity trend, respectively. Those trends, however, could be decreased by taking Chlorella. Based on the above, it was suggested that taking Chlorella could be effective for prevention and improvement of dry mouth. Significant increase in relative ratio values of cuticle moisture was shown at Week 4 and 8 in both Active and Placebo groups compared to the starting day (Fig. 2).